BLOWOUT SALE. 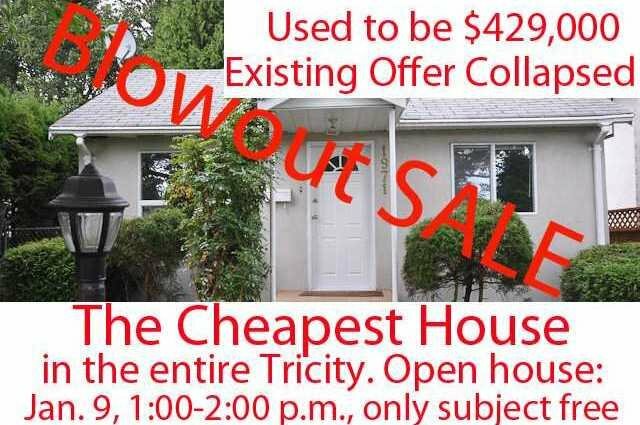 THE CHEAPEST HOUSE IN THE ENTIRE TRICITY. FIRM PRICE. OPEN HOUSE: JAN. 9, 1:00-2:00, Rancher (960 SQFT) with a separate unauthorized detached bachelor suite (440 SQFT). Private fenced yard. The main house comes with 3 bedroom, one full bathroom (4 pieces) and 5 pieces of appliances (Washer/Dryer/Fridge/Stove/Dishwasher).The bachelor suite comes with its own kitchen, full 4 piece bathroom and complete set of appliances (Washer/Dryer/Dishwasher/Fridge) and hot water tank. The main house used to be rented for $1,250 per month. The bachelor suite may have to be converted back to garage or workshop. ONLY SUBJECT-FREE OFFERS WILL BE CONSIDERED.